Ultra HD Foundation - I've been testing this foundation for the past few days and so far I've been seriously impressed. It's got great build-able coverage, a gorgeous consistency (not dewy but not matte either), and a very skin like finish. It's designed to keep skin looking flawless both on screen and in real life. Formulated for HD, 4K technology it's perfect for photoshoots and events. Since it doesn't contain any SPF it makes it ideal for nights out where flash photography might be present. While wearing it each day it's proven to be long-lasting and hasn't caked up on any areas of my face. I've been using a flat buffing brush for for an airbrushed look. Step 1 Primers - [Hydrating] is for normal skin and can be applied to the entire complexion. It's my first step after moisturizer and can definitely tell a difference in the finish of my makeup after using this one. [Mattifying] is formulated for oily skin and it is perfect to use in the areas where shine develops quickly. Only a small amount is needed since it is for spot treating areas. [Nourishing] is ideal for dry skin and can be applied to help combat areas where skin flakes. [Smoothing] is perfect for skin that has enlarged pores and fine lines. I use this one on top of the Hydrating primer to spot treat areas (such as around my nose and forehead). Rodial has always been known for phenomenal skincare (such as the new Snake Booster Oil pictures here) but they have also recently launched a makeup brand that is equally as great. 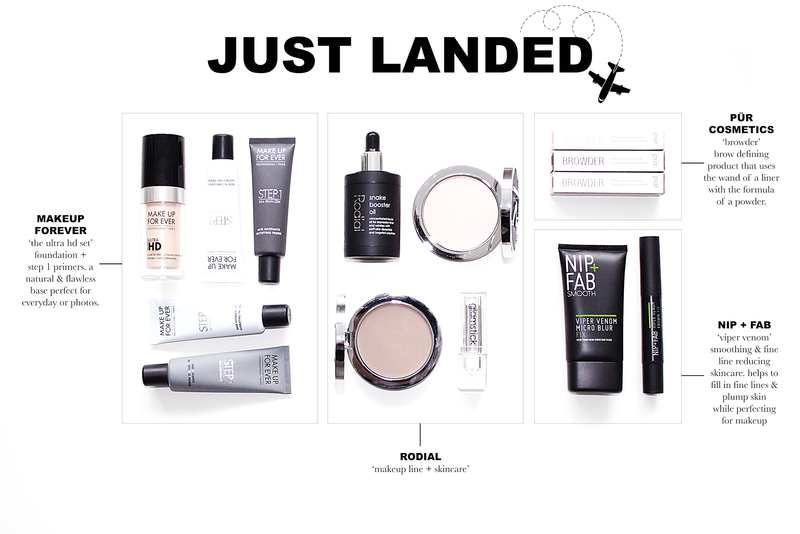 With luxurious packaging and products to match, everything I've tried has been a hit. The illuminating powder is definitely a favorite, perfect for days when you want a subtle highlight and shine. The contour is a gorgeous neutral shade - not too bronzy and not too ashy. My favorite though, are the Glamsticks the packaging and the product are fantastic. A balmy lip product with a wash of color. Perfect to throw in your bag and take on the go. Plus who could resist that amazing lucite packaging. The Snake Booster Oil is soft and hydrating that helps to firm and tighten the skin. It's a product that works over time to really make a difference - so I will have to be reporting back on this one after some extended use. It launches this January for any of you looking to snag it! This fun little launch landed on my doorstep and I was instantly intrigued. The Browder has the packaging/casing of a liquid liner (with a precision tip applicator) but the formula of a powder. Its meant to instantly boost your brows and fill in sparse areas. It is definitely pigmented and packs a serious punch - however be careful when using, there is a lot of fall-out from this one. Nip + Fab is a skincare line that I was introduced to over the summer and instantly fell in love with. Their KALE mask is one of my favorites to reach for when I need something to boost my skin a bit. The new Viper Venom line focuses on perfect the skin and reducing the appearance of lines and pores. The Micro Blur Fix is a priming serum that gives an instant blurring effect to the skin by doing this is reduces the appearance of pores. It is also perfect for someone who can get a bit oily. The Frown Fix comes in a click-pen style and works to help plump areas of the skin and reduce frown lines. Upon applying this and massaging it in I can instantly feel a tingly sensation that is working to help plump up areas of the face. It is also super hydrating and nourishing on the skin. What new launches are you loving and what are some you are dying to try? Let me know in the comments so I can add them to my list! *All product in this post c/o each respected brand. Please note, this is not a sponsored post and all thoughts/opinions are my own.